NXP Semiconductors, AuthenTec and DeviceFidelity Inc. announced that they are jointly developing reference designs that enable secure mobile payments via Android-based phones through the use of fingerprint biometrics and near field communication technology. Reference designs created by the companies are expected to help mobile phone manufacturers and wireless carriers to address the growing demand for NFC-capable smart phones. NXP, AuthenTec and DeviceFidelity also collaborated to complete the first biometrically enabled NFC mobile payment transaction in the U.S. The successful transaction was made possible via a Motorola ATRIX 4G smart phone equipped with AuthenTec’s AES1750 smart fingerprint sensor and DeviceFidelity’s In2Pay microSD card based on NXP’s secure NFC solution. The mobile payment was conducted when the demonstrator swiped a finger over the smart phone’s fingerprint sensor, authenticating him as the pre-enrolled account owner and quickly launching a credit card app. Following authentication the user simply tapped the ATRIX smart phone against a payment terminal to complete the first fingerprint-enabled, secure NFC transaction in the U.S. NXP, AuthenTec and DeviceFidelity plan to collaborate further on additional, similar NFC-based designs to help enable the proliferation of mobile wallets in the U.S. and other regions. 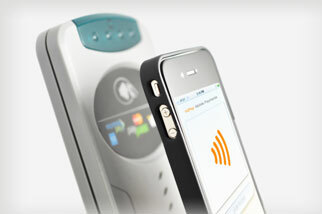 DeviceFidelity is also known for its iPhone case that enables payment on existing Apple handsets. Comment wasn’t immediately available on whether the companies were working on adding a fingerprint scanner as an option to those cases.